Many priests throughout the history of the Church in America have felt the call to be a missionary in this country: Bishop Simon Bruté of France, St. Junipero Serra of Spain and St. Damien de Veuster of Belgium. 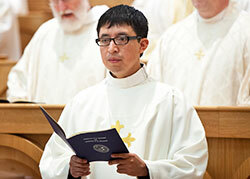 Add transitional Deacon Nicolas Ajpacaja Tzoc of Guatemala to the list of missionaries to America. The 35-year-old transitional deacon did not move to Indiana with his family as a youth or young adult. He chose to come in his late 20s, with a specific purpose. His 2,500-mile journey from Totonicapan in Guatemala to Saint Meinrad Seminary and School of Theology in Saint Meinrad has had its twists and turns. From seminary, to teaching, to moving to a country where he did not speak the language, and to seminary again, Deacon Tzoc has pursued his call to serve the Church as a missionary to Latino Catholics in the U.S.
Deacon Tzoc first felt a call to serve in the Church in the sixth grade when he attended his cousin’s first profession of vows as a Franciscan sister. After his confirmation at age 16, Deacon Tzoc was selected to be involved with a special Catholic youth group in Guatemala. He also got to see the leadership of Augustinian Father Valerio Baines Sanz, who worked with the group and also served as pastor of Deacon Tzoc’s parish. Still feeling called to serve others after his stint with the youth group, Deacon Tzoc entered Asuncion Seminary, which is affiliated with Universidad Rafael Landivar in Guatemala City in the same way that Bishop Simon Bruté College Seminary is associated with Marian University, both in Indianapolis. He obtained a bachelor’s degree in philosophy from the university in 2007. But despite feeling the call to serve since the sixth grade, Deacon Tzoc decided not to continue on to priestly formation. “[It] didn’t fulfill my expectations, especially in academics, at that time,” he says. Perhaps as a foreshadowing of his future call as a missionary, Deacon Tzoc wanted to study abroad. The school he applied to that would accommodate his desire to venture from Guatemala required a degree from outside the seminary before he could be accepted. So he attended Universidad Rafael Landivar in Quetzaltenango, Guatemala, working toward a psychology degree, while also working for a government scholarship institute and teaching at a high school. Deacon Tzoc went on to study abroad—but not as he initially expected. He felt a call to the priesthood again, but this time he looked outside of Guatemala, sending applications to Germany and Spain. He also applied to Saint Meinrad, where the Diocese of Owensboro sends its seminarians. When he arrived in the U.S. in 2011 to become a seminarian for the Owensboro Diocese, he “had no idea how it would be, no relatives here, knew no English,” Deacon Tzoc recalls. Before starting at Saint Meinrad, he was required by the Diocese of Owensboro to spend his first year at the University of St. Thomas in St. Paul, Minn., learning English. By 2012, he was studying at Saint Meinrad in the far southwest corner of the Archdiocese of Indianapolis to be a priest for the western third of Kentucky. As he studied at Saint Meinrad, though, something changed for Deacon Tzoc. After about two years, says Father Augenstein, Deacon Tzoc “felt that the Archdiocese of Indianapolis was a better fit for him” than the Diocese of Owensboro. By the summer of 2013, Deacon Tzoc became a seminarian of the Archdiocese of Indianapolis, continuing to study at Saint Meinrad. He spent his first year as an archdiocesan seminarian completing a pastoral year at Holy Family Parish in New Albany. Father Daniel Atkins, pastor of Holy Family, was impressed. Deacon Tzoc’s trilingual skills came in handy in helping Father Daniel Staublin, pastor of St. Ambrose Parish in Seymour, minister to a large community of Guatemalan Catholics. Father Augenstein also noted Deacon Tzoc’s gift for working with both English and Latino Catholics. As Deacon Tzoc approaches his ordination, he looks forward to beginning his life as a missionary priest at his first assignment: as associate pastor at St. Simon the Apostle Parish and helping with Hispanic ministry at St. Lawrence Parish, both in Indianapolis. And he looks forward to starting his life as a priest in general. Father Staublin witnessed Deacon Tzoc’s desire to be with others. “He made many, many friends while he was here at Holy Family,” he says. “He definitely sees himself as a servant-leader. The combination of a desire to be a missionary with his passion for people will make Deacon Tzoc a blessing to the Church in central and southern Indiana, says Father Augenstein. Favorite Scripture verse: Psalm 27:9, “Do not hide your face from me.” “It’s the merciful faith of the Father,” says Deacon Tzoc.